Hello again, and welcome to the sixth of seven lessons in the Profit From Your Hobby mini course. Did you like the way Jim used two of his favorite topics, found out what other people wanted to know and the problems they were having, and then built unique websites filled with useful content that have helped solved those problems? This sort of long term thinking is what typifies a successful SBI owner. Nothing worthwhile is built in a week or even in a couple of months, but Jim has created two lasting, long term profit streams using simple tools and a proven system. Today you'll meet Jerry Mack. Jerry took his knowledge and experience working for a large business (he was a regional manager for a medical imaging company, and was doing very well for them), and took those same skills, went out on his own, and has never looked back. Now he sells a similar range of medical equipment and gets to keep the profits for himself. Jerry's story serves as a beacon for anybody who feels like they are trapped in a situation where they are making a lot of money for somebody else and are looking for a way of keeping more for themselves. I know you'll enjoy reading Jerry's story. To download your fifth lesson as a .PDF ebook, simply 'Right Click' on the link below. When you do, a menu like the one to the left will open up. 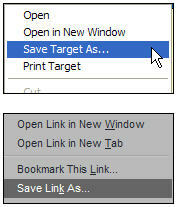 In Internet Explorer choose "Save Target As..." and download the file to a folder on your computer (in Netscape, Mozilla or Firefox you choose "Save Link As.."). Right Click Here To Download Your Sixth Lesson! If you'd like to build a web business like all of these people have done, and get hundreds of dollars of additional bonuses at no extra cost, visit this page to get started. You'll find full details of what's included in the bonus package in each ebook. P.S. And don't miss tomorrows lesson where we'll wrap up this series and consider some other important questions.